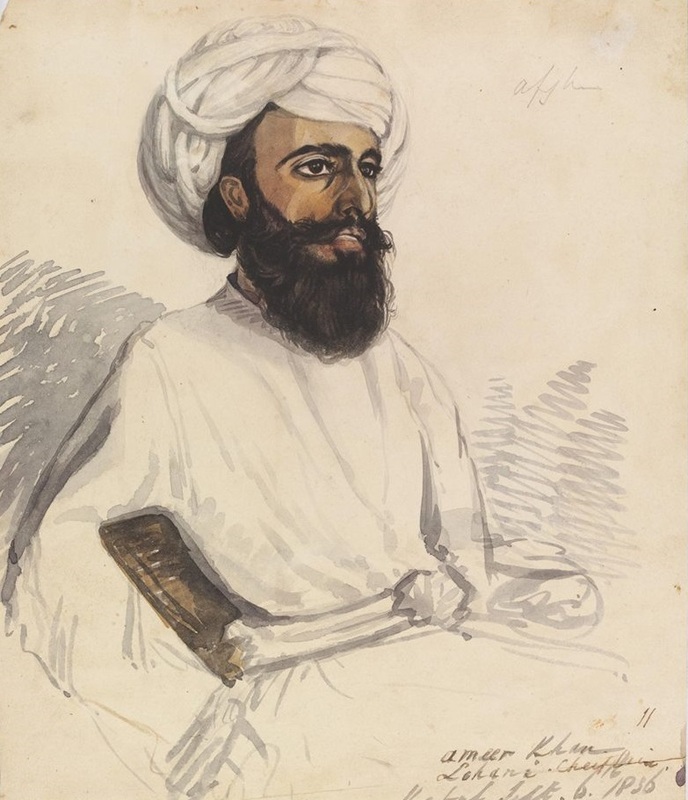 Ameer Khan, a Lohani Cheiftain', 1836. By Godfrey Thomas Vigne. During Summer, most of the Lohani/Nuhani men used to go to Bukhara and Samarkand for trading or for buying and selling at Kabul. The women and children , along with some guards, lived in the tents. In Autumn, the tents were stowed away in a friendly fort and men, women , children and animals used to go down the Gomal pass to the Derajat, bivouacking all the way. They then pitched their second set of tents, kept in the Derajat. The men used to go to upper provinces of Hind to be back by April; some men used to stay back to guard the families and the camels. In April, they used to track back through the same pass to their old camps/villages in Ghazni-Katawaz.They were fond of Pomp and show, and exhibited their wealth by braiding the hair of their children with Gold coins, ornamenting their women with massive ear-ings and covering their horses with expensive trappings. Young brides were carried on cushions of silk on the backs of camels, most gorgeously hung with tassels, coins and bells. "During our stay there, the foragers brought in from villages in the plain, masses of sheep and cattle, and , from Afghan traders met on the roads, white cloths, aromatic roots, sugar, tipuchaqa and horses bred for trade. Hindi Mughal unhorsed Khwaja Khizr Nuhani, a well known and respectable merchant , cutting off and bringing in his head."